We still have a mailing list of people looking for this pig in all sizes, but Shelby’s email address is no longer valid. I am looking for a terry cloth pig, the larger one, which is maybe 12-18 inches. 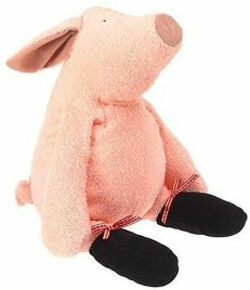 The manufacturer is Manhattan Toys, and the name is Tip Toes Pierre Pig, made of towel like material with black feet. Olivia (the pig) belonged to my mother, and my 4 year old daughter, Faith, had wanted to take her home, but her grand mother really was not too keen on giving her away. So we stuck with visiting. Then in August of ’09, our home burned to the ground, and since Faith had lost all of her toys, Olivia came to stay with us and has become a part of our family. We started to take several pictures of Olivia to show my mother that not only was Olivia safe, but she was having the time of her life. Now it is a regular thing we do, and on May 2nd, Olivia will be doing the Walk for Hunger. We are trying to find another Olivia to keep in our closet in case anything happens to her in the future. Haha! I love your blog. =) We take our Pierre pretty much everywhere we go too. We also have tiptoes pig with green feet and just recently got mediterranean madge pig (she loved the beach and got a great tan)! As you can see, we ♥♥♥ tiptoes pig in my household! I am always on the look out for these pigs, so if I see one pop up on ebay, I will let you know. Good luck to Olivia in the Walk of Hunger! That is great, we love her so much…the one we have actually has black boes on her shoes though…I have neber seen her with black bows anywhere else but we will take what we can get. Really excited for the 20 mile walk on May 2nd! Hi, Shelby. Pierre is listed on ebay right now, buy it now or best offer! I’m not sure how much you are willing to pay for a backup, but maybe you could try and make an offer first. Good luck! Thanks for helping with the search, Jean. I’ve sent the eBay link to the mailing list for this hard to find pig. Thanks, Brieanna. I sent this link to the mailing list. Thank you all so much for helping! Were still on our search. WE <3 OLIVIA!!!!!!!! I am still searching for the full size tip toes pierre if you can find one. Good news is I think this is the bunny. Bad news the price. It has an or best offer. Here is the link. I’m sorry! I goofed! Bunny not pig. Will keep looking! I would LOVE a picture and if you could tell me what your looking for $$ that would be great too. Thanks so much! Hi – my 2 year old daughter is in love with her Tiptoes Pig too…and last night, to my (and soon, her) distress, Piggie vanished. No doubt left in a playroom or in the park. Now I’m trying to find a replacement. If anyone has one, or a lead on where I might find one, I would be most grateful! $110 is a lot of money…but I’d pay it if I could find a listing! I just posted a large pig with green shoes on eBay. Starting $60; But it Now for $75. Thanks, Jenny. Sent to the mailing list. I have the Pierre Pig with black (ribbons are pink, not plaid) that is 16 inches from top of head to toes. It has never been played with and is in what I assume is top notch condition. It is for sale (this site popped up on a google search for pricing this and other plush I received as gifts when I had an animal related job). If anyone responds with contact information, I will be glad to send a photo. Based on posts, I’d offer at $100. I have 11 inch Tippy Toe pig , black feet with pick bow, Terry plush stuffed beanie toy, I just found in a box stuffed away. Would like to sell anyone interested? Correction on Tippy Toes pig, sitting is 11inch standing is 16inch.